The N.W. 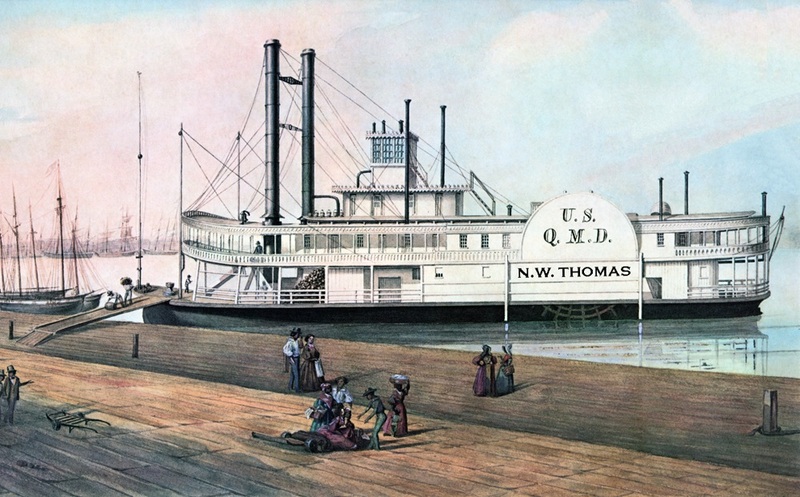 THOMAS in an early color lithograph. Since there are sailing ships in the distance on the left the locale was probably New Orleans. At the beginning of the Civil War the N.W. THOMAS was conscripted by the Federal government, thus the initials U.S. Q.M.D. on the paddlebox which stood for the United States Quartermasters Department which transported supplies of all kinds to troops fighting the war in the South. 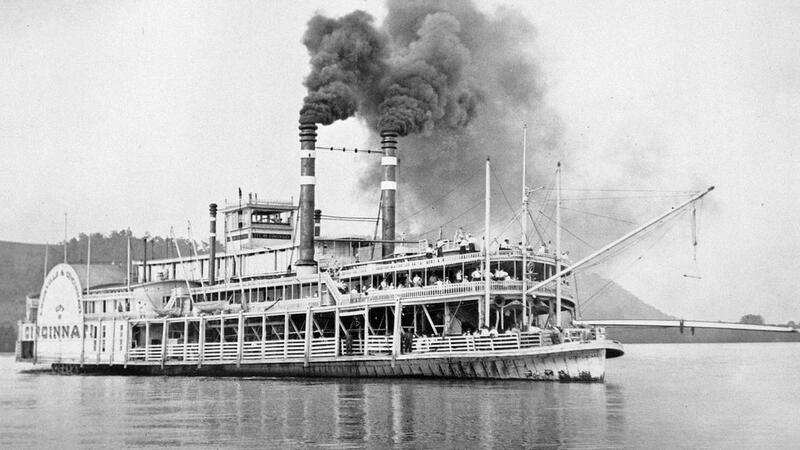 "After the taking of Paducah, Kentucky by the Union forces under Grant in September, 1861, steamboats of every kind, character, and description were commandeered by the government and ordered to Cairo, Illinois (where the Ohio River flowed into the Mississippi) immediately for government service. The immensity of this steamboat concentration was revealed to the people of Evansville, Indian when on September 18, 1861, a fleet of thirteen steamers, with the steamer N.W. THOMAS as flagship, and 120 barges, came down to Evansville where they laid over to receive further instructions before proceeding to Cairo. A large crowd was on hand at the wharf to greet the fleet." 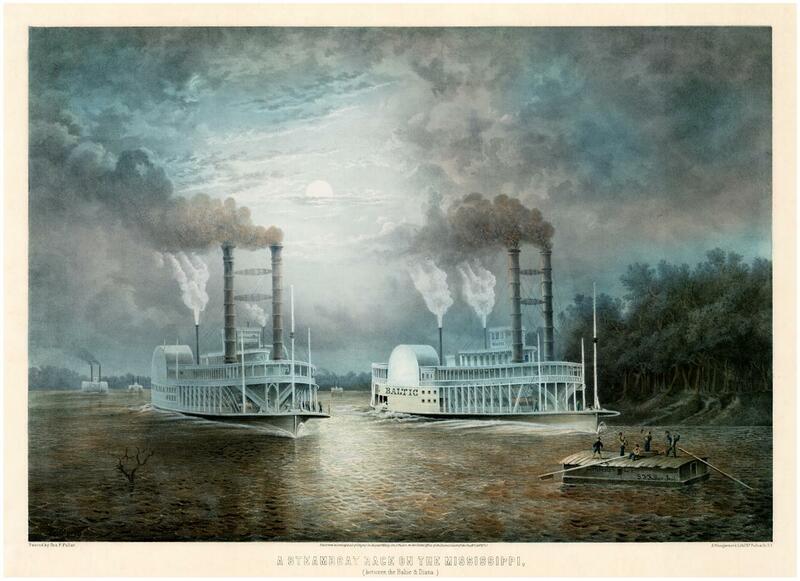 excerpted from "Evansville Steamboats During the Civil War"
I suspected that the big boat in the color lithograph No. 536 published by Donaldson Litho. in Cincinnati circa 1890's was based appropriately enough on the City of Cincinnati and attached is visual evidence from the Murphy Library collection. What a Jim Dandy match. Photo of the City of Cincinnati. 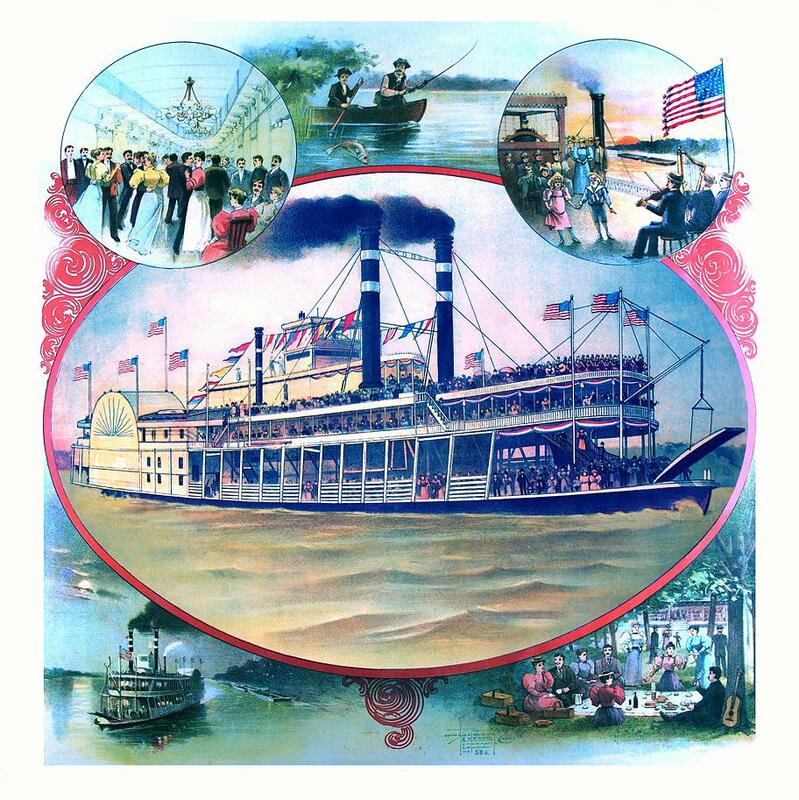 The same steamboat in a poster. This was scanned from a calendar art print which is approximately 40% the size of the large color lithographs (16 1/2 x 41 1/2 inches) that were framed and displayed in bars and saloons to promote the product of the St. Louis brewing company. Attached detail from 1905 color lithographed post card of the BAILEY GATZERT and the REGULATORin the Cascade Locks on the Columbia River between the states of Washington and Oregon. Beautiful color lithograph promoting the GRAND REPUBLIC. 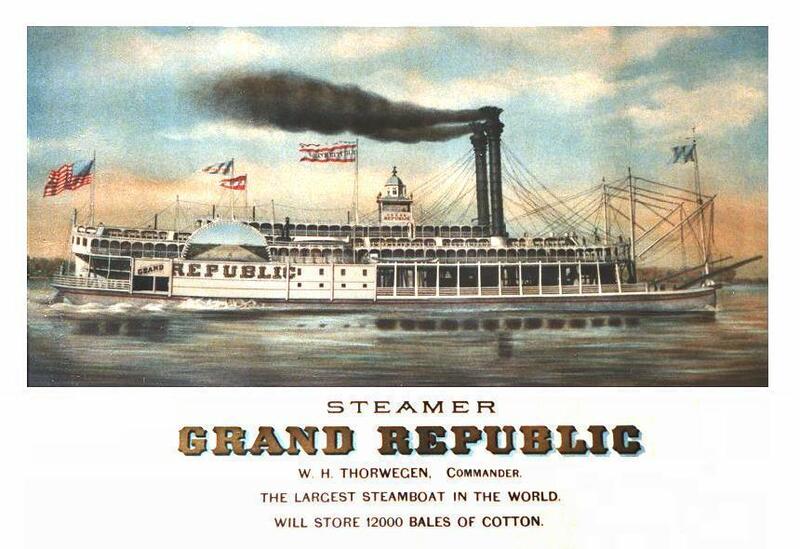 A side wheel packet with a wood hull, originally built as the GREAT REPUBLIC (Way #2438) in 1867 and then remodeled and renamed GRAND REPUBLIC in 1876. 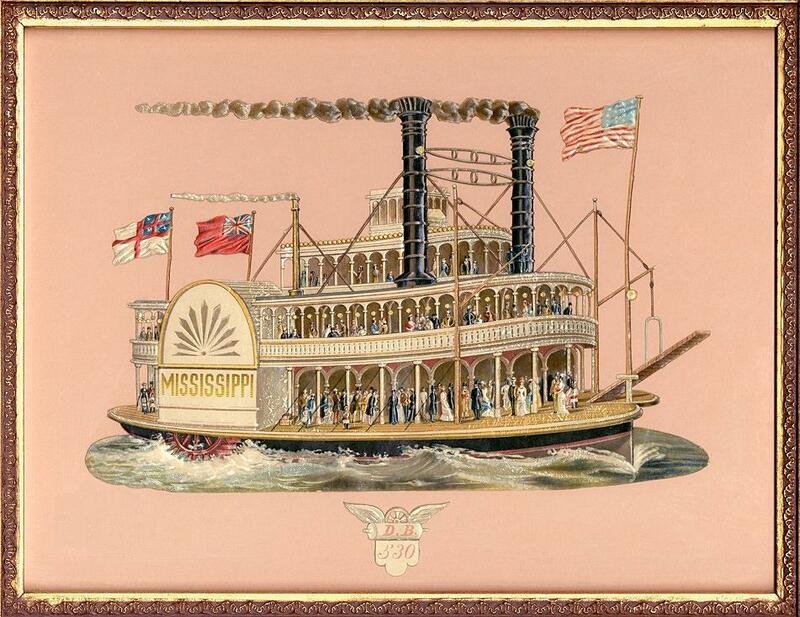 Owned by Captain William H.Thorwegan, she operated on the Mississippi River until she burned at St. Louis on September 9, 1877. Must've been state of the art bas relief lithography and dye cut technology for 1890. Apparently a sort of thin film was applied over the image was printed and due to heat and exposure over a hundred years plus resulted in some crackling/blistering visible on the main deck and paddle box etc. The two flags at the stern appear to be British yachting banners so the design and manufacture of this may have been done in England. The racer ROB'T E. LEE in a celebratory black and white lithograph published after her 1870 win over the NATCHEZ at the conclusion of their famous race. Way's Packet Directory Number 4777 gives a colorful and detailed account of the race, New Orleans to St. Louis, June 30 to July 4, 1870. 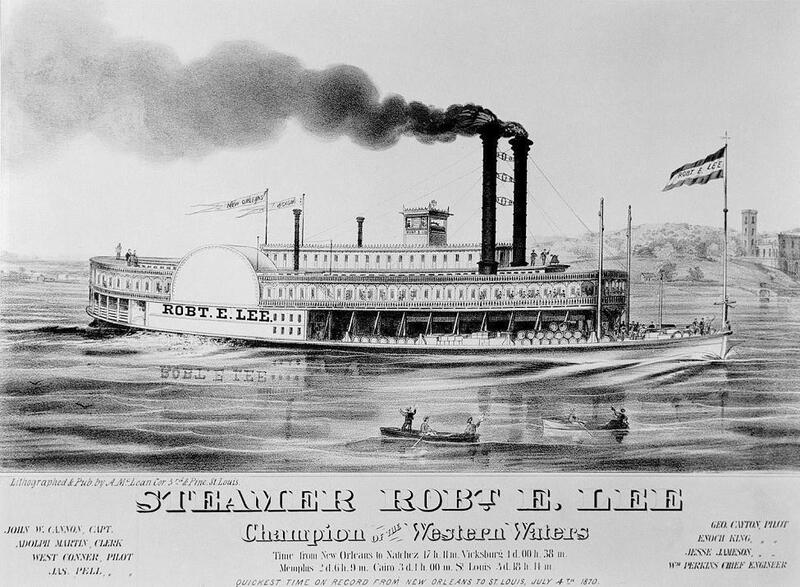 The ROB'T E. LEE Lee made the trip in 3 days, 18 hours, and 14 minutes, the all-time record for a commercial steamboat. Other trips included New Orleans to Cairo, 3 days, one hour, one minute, and New Orleans to Natchez, 17 hours, 11 minutes, both in 1870. 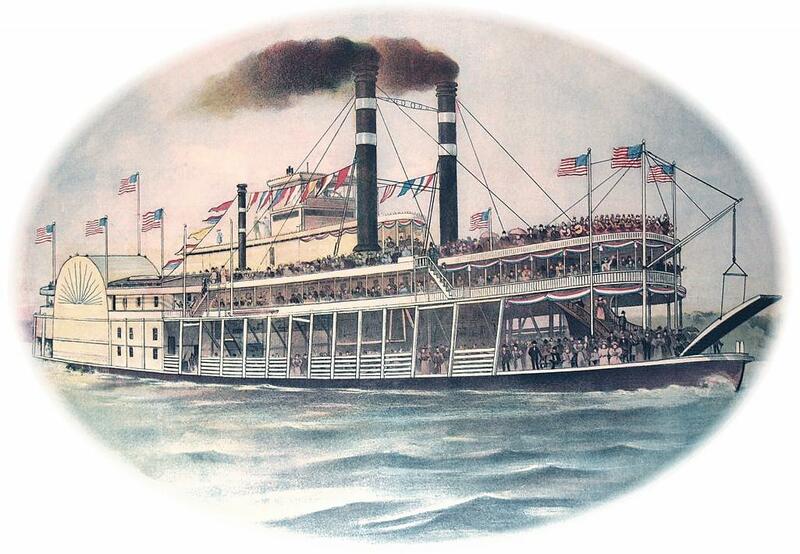 On December 22, 1870 she collided with the Potomac opposite Natchez, Mississippi. The Lee sustained much damage and was run out on a sandbar until she could be raised and repaired. 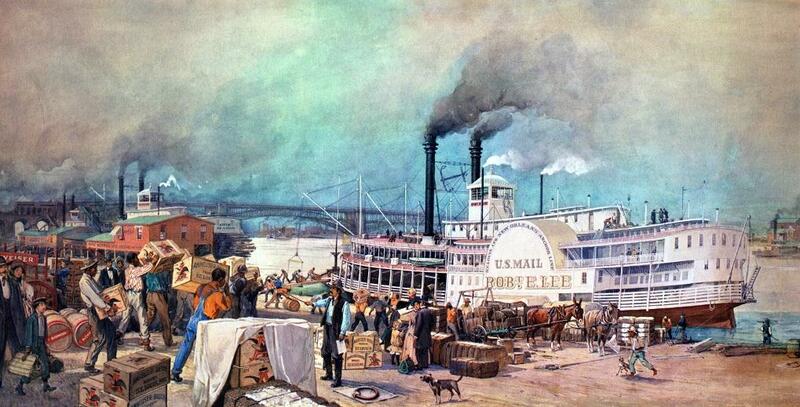 She brought her record cotton cargo of 5741 bales to New Orleans in 1874. When she left New Orleans for Portland, Kentucky, for dismantling, mid-April, 1876, several thousand came to see her off, with many salutes en route to mark the closing of her career. Her hull was taken to Memphis for use as a wharf boat. Much of her equipment went into her successor, also known as the ROB'T E. LEE. La Crosse Steamboats Neg. 44084. The ROB'T E. LEE deserves to have her own page one of these days.